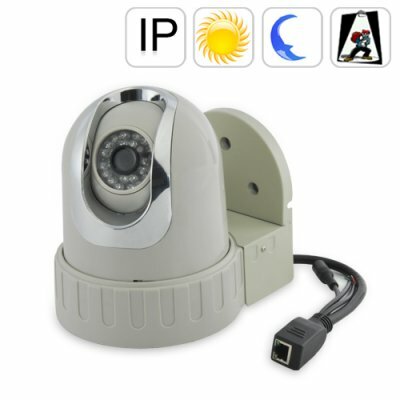 Successfully Added IP Camera with PTZ - Surveillance Camera with Sony CCD to your Shopping Cart. Wall or ceiling mount dome style IP Security Camera with Pan and Tilt. Having a Sony CCD image sensor, night vision, this is one of the best surveillance camera solutions for anyone needing a true Pan and Tilt IP Camera with high quality video for business or home security. How does an IP Camera work? Simple - you connect this Security Camera to your router or network via a standard ethernet cable, setup the IP Security Camera username, password and URL with the included user-friendly windows software, and then you are ready to view the live video footage from anywhere in the world using a simple IP address typed into your IE web browser. Where might I use this IP Security Camera? The possibilities are almost endless! Imagine all the places you would normally use a CCTV Security Camera - University Buildings, Retail Shops, Building Lobby and Entry Areas, Parking Garages, etc., you can use this IP Camera in all those same places. With a full array of night vision IR's and housing that easily allows for wall or ceiling mounting, you can use it just about anywhere. And this surveillance camera has the added benefit of being able to be remotely accessed from the internet! Now that it's setup, what can you do with this IP Camera with PTZ? Using a web browser interface, you can pan and tilt the IP Camera to view and capture anything you want! Record video footage to your computer all day long, on a fixed schedule, or only on a motion detection alarm. By using you computer like a normal security camera DVR, the ease of recording and organizing your video surveillance files is easier than ever. This IP security camera also comes with an amazing selection of configurable software and hardware settings for day and night surveillance, image adjustment, logging and recording options, and much more. You can even take a picture when the alarm goes off and automatically email it to yourself/others for instant alert notification. Included is the full version of ImagiaTek MultiWindow for accessing the PTZ camera control and DVR features. Buy one of these high quality security cameras now to keep track of your business or home from anywhere in the world. A very low China wholesale price along with Chinavasion's famous 12-month warranty makes this an easy choice for anyone serious about safety and security. Click "add to cart" to order yours today. We recommend using Internet Explorer (version 6.0 or newer) to access the web control interface. You may also need to install the latest version of ActiveX to be able to view the camera. Admin and null are the default username and password (as printed on the rear of the camera).